Just as an increasing number of companies are looking to wellness programs to give employees ways to exercise, they also are giving workers more wholesome food choices. In a recent survey of 1,000 office workers, split almost equally between men and women, two-thirds of those working in offices with well-stocked cupboards said they were happy with their jobs. In addition, 83 percent said that having healthy and fresh snack options was a huge perk. The survey was conducted by the Opinion Research Corp. in conjunction with Peapod.com, a major online grocer. The Best Places to Work list is peppered with companies that offer employees free food with an emphasis on healthy snacks. For example, at C2 Solutions Group Inc., a technology firm in Reston, the corporate office is stocked with complimentary bottled water, juice, teas, caffeine-free drinks and popcorn, pretzels and granola bars. Bagels and fresh fruit are received weekly. Noah Enterprises, a construction firm in Virginia Beach, treats employees to a smoothie bar. A well-stocked kitchen also offers fresh fruit, nuts and protein powders. He adds that food also brings people together and promotes a team atmosphere. Hegamin says one of the company’s favorites is Noah Spa Water, made daily with fresh cut cucumbers and lemons. “Lemons and cucumbers promote digestion,” Hegamin says. American Global Logistics, based in Martinsville, says it strives to provide employees with healthy food options, including gluten-free, low-calorie and organic offerings. And ByteCubed, a technology company in Arlington, has a cafeteria that offers a smoothie machine and salads. 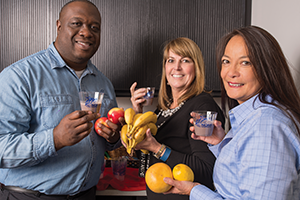 Bon Secours Virginia has fashioned one of the most ambitious efforts aimed at providing employees with wholesome food choices. Bon Secours is a Richmond-based health system with hospitals and other health-care facilities across the state. 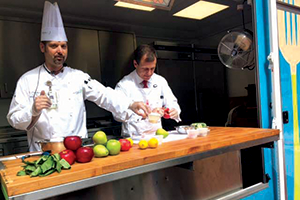 Its food effort has been tagged “Simply Fresh.” One part of the program involves a mobile learning kitchen — called “Class-A-Roll” — that travels to various Bon Secours facilities. Dietitians and chefs lead cooking demonstrations on preparing healthful dishes. “Folks get to taste all of the food items. There’s so much momentum and excitement, and we continually include our executives, including our CEO and vice presidents, who put on aprons and participate,” says Irena Korshin, a project analyst for employee wellness at Bon Secours. Rachel Bulifant, manager of community nutrition at Bon Secours, says that when employees see top executives buy into the program, it makes everyone aware that it’s an important initiative. Bulifant adds that, in a sense, the program is an effort “to go back to the basics, finding outlets within our community for fresh products and seasonal values.” By seasonal values, she is referring to the idea that foods eaten in season have the most flavor and nutritional value and are more affordable. The company also has brought its fresh food initiative to employee cafeterias, where it promotes fresh-food options. In large part, Bulifant and Korshin say, Bon Secours’ fresh-food initiative is in response to workers’ requests. “Sixty percent of our employees say they want to make dietary changes,” Korshin says.